Crew on board the 72 metre Dunya charter superyacht Axioma performed a mid-Atlantic rescue after a passenger on a nearby sailing yacht fell ill.
Axioma received an emergency call at 8.40am on December 11 from the 16 metre sailing yacht Mowe 2. The yacht was requesting emergency medical help for a man on board suffering from severe abdominal pain. The Axioma crew acted quickly by contacting medical authorities and gathering the yacht’s medical equipment together in the main saloon. They then sent a rescue boat over to Mowe 2 to collect the patient and bring him on board. Supported by the international SOS system MedAire, the crew provided aid to the patient before transferring him onto the medical ship Esperanza del Mar via a rescue boat at 4.30pm. 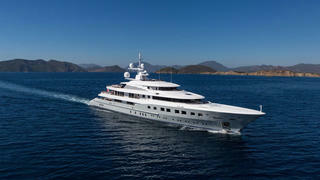 Axioma has now continued her journey onward to the island of St Martin for the winter Caribbean charter season. Delivered in 2013, Axioma was designed by Sterling Scott and can accommodate a total of 12 guests and 20 crew.